“Wonderful” Pomegranate, beautiful color in Spring followed by huge fruit in the Fall. Low water, low to no maintenance. Daylily (below ) is easy to grow and blooms several times a year. much longer than I had anticipated, so I am going to talk about my favorite perennial flowering plants today. In the near future, I will talk about shrubs, trees and grasses as well, both sun and shade, but today let’s start with full sun plants. The list is long and plentiful and loaded with color , one of my favorite and versatile sun plants is the sage (2-4′). This is a huge group, it encompasses many plants and many colors and all work very well in the TX sun. The Mexican Bush Sage is a lovely purple Sage and it is a huge Hummingbird attractor as are all Sages for the tubular flower they posses. The Sage family also include herb Sage such as the Pineapple Sage that is delicious in Tea and boasts a lovely scarlet flower, very prolific and beautifully elegant. 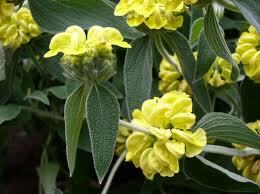 Jerusalem Sage is an outstanding plant with Yellow flowers in the shape of a crown and the evergreen plant is a true Sage color. The fern-like Russian Sage is elegant and stately and while a little fickle in some spaces, when you do have success with this plant, you will enjoy every minute of it. Salvia, also in the Sage family, has many great varieties that do well here. and keep pesky bugs away. I have actually planted an old store-bought onion that started to sprout and it flowered the most lovely white snow ball in the summer. Try it out, you will be surprised what comes out of that old onion. Garlic’s will do the same if you have some that have started to bud. Just plant it an inch or so beneath well drained soil, budding side up and water until established. Other succulents like Sedums, Echiveria and Aloe Vera, are also wonderful plants in the garden. Potted plants require water more often. There are also many great Cacti here. multiple types of Yucca, Sotol,and Agave (3-6′) to name a few, are great plants for this heat, but be sure to plant responsibly. Agave are swords dressed up as plants. These plants can be very large when mature and they can have razor sharp spines and daggers at the end of each leave. These are not plants to have near children or pets and should be carefully used in front yards where neighbors and their children might be. Turks Cap, both Giant (5-6′) and dwarf (3-5′) are awesome plants for central Texas, you will hear me mention these again in the shade section as they do well from full sun to shade and are one of the only plants I know that do this well. The colors are bright Red, Pink and White, The dwarf does best in Red and Pink, and the giants do best in Pink and White in my experience. Both varieties have unique leaves and leaf color and I encourage you to give them a try. Great plant for filtered light too. 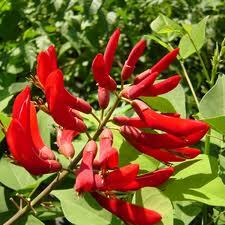 Firemans helmet/cap Coral Bean 8 x 8, full to part sun blooms from spring to fall, then goes dormant in winter. Fireman’s Cap’ Coral Bean. Quite literally one of the most fabulous plants around, poisonous and spikey, but fabulous and an absolute show stopper of a plant. Your neighbors will covet this to be sure. Hummingbirds go crazy for it and with the mature size of a 8×8′, there will be plenty of real estate to share. A few more excellent sun plants are Yellow Bells Esperanza (6’x3′) (below) which is an amazingly beautiful plant and should be in every yard with sun. The Pride of Barbado’ s (6′) is another fabulous plant with 6′ of Orange/Red/Yellow flowers with uniquely mimosa looking leaves. The Rock Rose is a great evergreen plant about 2′ -3′ tall that has 1″ Pink flowers all season long (in the Hibiscus family) and the Pink Skull Cap is an awesome evergreen ground cover plant that has tiny hot Pink flowers all season long. The last underused sun plant is the Rose. Roses get a bad wrap, but they are lovely when you use the low maintenance Earth Kind varieties like Knock out, Home Run, Mutabilis, Old Blush and many others that can be found on the Agrilife extension’s website of Earth Kind Roses. You can also visit my YouTube for some other great plant suggestions! I would love your blog even more if you added photos of the plants you mention or link to another site that has a photo of the plant. Thanks for the great info! Love the blog! Keep it coming. So many of my favorite Austin plants here! Just wish I had a landscape big enough for all these. I planted a coral bean along the south side of the house two autumns ago; it didn’t die back this year, so I’m hoping for full tree size this summer. And lots of hummingbirds. Amy, I am not sure most people realize how fabulous and colorful a full sun garden can be here in Austin. There are beautiful plants for our area and frankly, the sun garden is my favorite for that reason. Not too mention the added benefit of Hummingbirds and butterflies!